The most interesting things in HTML5 video games happen when sprites conk and collide into each other. Game engines normally have some sort of tool for testing whether two sprites are overlapping. This is called collision detection, and it can be done a number of ways. This example uses the standard bounding rectangle scheme. It’s not perfect, but it’s very easy to implement and is commonly used. Take a look at colTest.html and you’ll see a simple example. 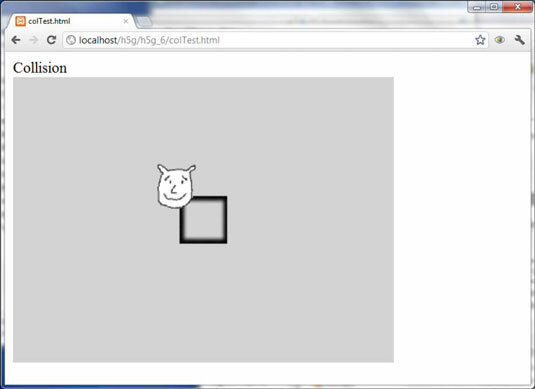 In the colTest.html example, the user moves the critter with the mouse, and you’ll get a message when the critter is touching the box in the middle of the screen. Hide the normal mouse cursor. When you’re going to have some other object follow the mouse, you normally want to hide the normal arrow cursor. In simpleGame, use the game.hideCursor() method to hide the mouse cursor inside the game screen. Create more than one sprite. It takes two to tango, or collide. In this example, the box will remain stationary, and a critter that follows the mouse. Give the critter a followMouse() method. In this example, you have the critter follow the mouse. Begin by creating a followMouse() method. The mouse position is determined (in simpleGame.js) with the document.mouseX and document.mouseY properties. Copy the mouse position to the critter position. Use the mouse’s x position to set the critter’s x position, and repeat with y. Call the critter’s followMouse() method every frame. As usual, the update() function is where you put code that should happen repeatedly. If you play around with the colTest.html page, you’ll probably notice that the collisions are not exact. It’s possible to have a collision register even when the critter isn’t actually touching the box. This is important because simpleGame uses a scheme called bounding box collisions. This means you’re not actually checking to see whether the images collide but whether the rectangles around the images collide. In this example, the difference is minor, but you’ll sometimes see significant errors with this mechanism, especially with elements that are long and thin. 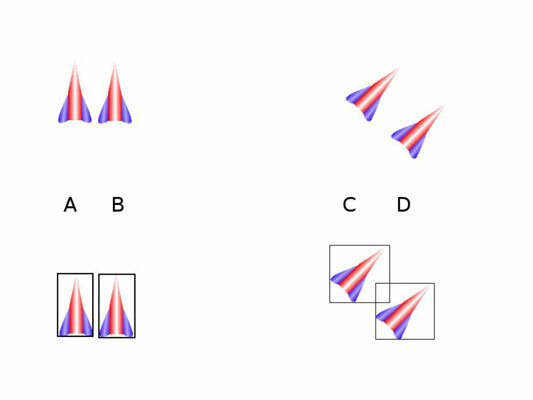 As a sprite rotates, the size of the bounding rectangle can change. The collision distance is constant. The distance between image centers will not change when images are rotated, even if the images change size. The collision threshold can be varied. You can set any sensitivity you want. Set a large collision radius for easy collisions and a smaller one when you want collisions to be triggered only when the sprites are very close to each other. Find the distance between the two sprites. Use the sprite’s distanceTo() method to determine the distance between the two sprites. If the distance is less than some threshold, count it as a collision. Generally you should use the width of the smaller sprite as a starting point for a collision threshold, but you can adjust this to make collisions more or less likely.